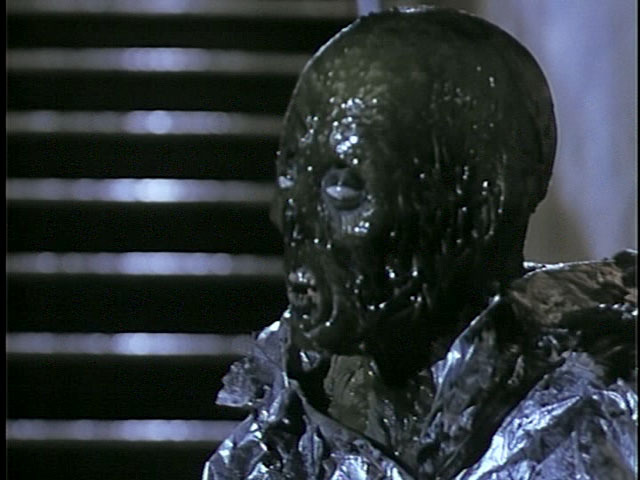 The Chilling (1989) Review – AiPT! Reviewing horror movies as a hobby naturally means that sometimes I have to watch some pretty terrible s--t. As a matter of fact, I have to do that quite often. When it comes to horror movies, I’m pretty resilient. But Deland Nuse’s and Jack A. Sunseri’s The Chilling has tested my limits and I’ve found my threshold for garbage isn’t nearly as steely as I once thought it was. It is time for me to rethink everything. At the Universal Cryogenics Laboratory of Kansas City, dead bodies are frozen with the hope that they might be revived by technology at an undetermined point in the future. That’s all well and good, except that the two-faced Dr. Miller (Troy Donahue) is secretly harvesting his patients’ organs and selling them to mysterious clients in Mexico. His secretary, Mary (Linda Blair), and latest client, Joseph Davenport (Jack De Rieux), aren’t aware of such goings on; they have more pressing concerns. Namely, all the frozen corpses have been brought back to life by a bolt of lightning. These cryogenic zombies (or “crynoids”, as they’re called) thirst for mayhem; eliminating all in their path. Oh, and nothing can stop them, but I’m sure you already figured that out. The story isn’t really the weak-point of The Chilling. I mean, it’s so cut-and-dry it hurts, with transparent characterization and needless subplots that go absolutely nowhere (“Oh no, that blonde woman knows about the Mexican organ-harvesters! It’s a good thing she never shows up again and her thread is never addressed afterward or that might mean tension!”), but lots of horror movies are capable of overcoming those sorts of setbacks with the right cast and effects talent. Hey, I think I just found The Chilling’s weak-point! The acting and production values of The Chilling are on par with such celebrated classics as Rock ‘n’ Roll Nightmare, Future-Kill and Troll 2. By some means or another (quite possibly blackmail), the creators of this film managed to reel in at least one person who’d been in a good movie before this: Linda Blair of The Exorcist fame (the trailer even makes sure to point out her Oscar nominated status). After her initial success, Blair pretty much dedicated her life to doing nothing but low-budget, crappy horror movies and “The Chilling” is just one more in a long line of them. As a matter of fact, despite being relatively famous, she phones in a pretty awful performance. Dan Haggerty, who plays a security guard named Vince, actually proves to be far more convincing. Go figure. Everybody else? Criminally untalented, to put it mildly. Be warned: This is gonna hurt. The crynoids look as stupid as they sound. Try to imagine the rubberiest zombies you’ve ever seen (I’m talking “discount Halloween mask”, people). Now put them in a tinfoil jumpsuit. You heard me; a tinfoil jumpsuit. Now put a little tinfoil hat on them. Okay, next, picture them with eyes that glow in the dark. That part sounds kind of cool, maybe? Well, their fingernails glow in the dark, too. Yeah, that’s right; these zombies are wearing glow-in-the-dark fingernail polish. Now, to complete the allusion: imagine them shuffling about, not just groaning, but cackling in high-pitched voices like cartoon witches. Ah hell, I’ll just show you. So there you go. That’s what a crynoid is. The crynoids, despite their supposed invulnerability, aren’t particularly aggressive. A drunken guy wielding a samurai sword manages to make it through the bulk of the movie. The Chilling may have been granted an R rating, but the whole thing barely seems up to PG-13 standards. Blood is minimal, the majority of it being used for bullet wounds during a bank robbery at the beginning of the film. The crynoids are filled with green goo, so you won’t be getting much gore from them, either. Their kills primarily consist of strangling the victim (and by “strangling”, I mean “grabbing the guy by his collarbone as he makes goofy faces and coughs”) and then dragging them off to an unknown destination, presumably for eating, but you never get to see it. I’m not going to say I was disappointed by The Chilling because that would mean I had expectations. I’ll just say that I’m very disappointed in you, Linda Blair. The Exorcist II: The Heretic I can forgive. Repossessed I can forgive. But The Chilling? Madam, the last of my good will is spent.